Thank you for expressing your interest in Freemasonry by actively seeking out this information. The information below should be sufficient to get you started on your journey in the Craft, but you may also want to visit the Grand Lodge of Pennsylvania's website for additional information. There is no simple definition of Freemasonry - ask ten Freemasons to define the fraternity and you will get ten different answers - and that is because Freemasonry is a "big tent" that appeals to men of all ages, races, creeds, interests, professions, and socio-economic status. Freemasonry, first and foremost, is a self-improvement organization that gives its members the tools to better themselves and grow as individuals. Each Mason leads himself on his journey, so different men grow by being involved with different aspects of the Craft that appeal to his interests and needs. Freemasonry is a fraternity of men that teaches philosophy and a system of morality. 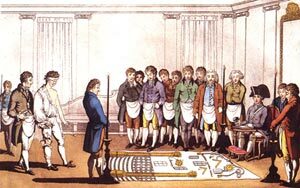 Masons are bound together by oaths based on the traditions of the medieval stonemason guilds and all Masonic law, legends, and customs are based on the Ancient Charges of those guilds. Masons obligate themselves to practice brotherly love, relief, secrecy, equality, and to uphold the ancient practices of the fraternity. Masonry is not a religion, nor a substitute for religion, and it teaches no religious dogma nor does it offer a plan for salvation. It is however religious in its character. All Masons must believe in a Supreme Being and obligate themselves to the Craft on the Holy Book of their faith. Non-denominational prayers are offered at all Masonic functions and each man interprets references to "God" for himself. Masonry is not a science, but does teach its members to value learning and experience. It encourages members to think and expand their mind but it does not tell them what to think. It also teaches tolerance of others beliefs and opinions and to regard each man as their equal, deserving of their respect. Our brotherhood leads to lifelong friendships, it offers the opportunity serve others, it opens our minds and encourages us to become "thinkers." It is no coincidence that great men for nearly 300 years have been initiated into our fraternity. After your petition for membership has been signed by two members and submitted, you will meet with three members of the Lodge (known as the Investigating Committee) at your home. Their job is to verify that you meet the necessary qualifications for membership and to help answer any questions you or your family may have about our fraternity. Following a favorable committee report, your petition will be voted on at a subsequent stated meeting of the Lodge and, assuming that the ballot is favorable, you will begin your journey through the three degrees of Freemasonry: Entered Apprentice, Fellow Craft, and Master Mason. Degrees are the steps of our initiatory system and are meant to explore ethical and philosophical issues on the path from lower to higher conditions of knowledge. The degrees are solemn, enlightening, and enjoyable experiences with no uncomfortable or embarrassing moments. It will take several months to progress through the degrees and there is memory work associated with each degree that you will work on with your assigned Instructor. The first step is to talk to a man you know who is a Freemason. Any Freemason will be more than happy to get you started in the process of petitioning a Lodge. If you do not know a Mason to request a petition from or to give your completed petition to, you should visit the Lodges page on this website to find a Lodge that you would like to affiliate with and contact that Lodge's Secretary. The Secretary will be able to help get you started in the process.